Octagonal bronze horizontal dial, mounted just above the ground level. Designed by Richard Schmidt of the USNO staff and cast by Alex Bigler of Equestrian Forge celebrates the 100th anniversary of the move of the USNO to its present site at Observatory Circle. The USNO was founded in 1830. Public, but by appointment only (202-762-1438). The bronze armillary sphere dial is unremarkable yet is oriented accurately and is complete. About 2 feet in diameter. Hour numerals are Roman and show 5 AM to 7PM. It commemorates a longtime gallery official. Bronze sundial on a concrete column. A 20 inch diameter bronze armillary on a four foot pedestal. Roman hour numerals from 3 AM to 9 PM. 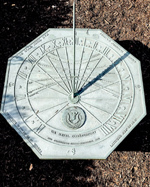 This simple bronze sundial about 12 inches in diameter sits on a 3-foot fluted plinth made from Indiana limestone. Embossed hour lines extend from 5am to 7pm delineated every 15 minutes. Surrounding the hour chapter are Roman numerals with the noon hour marked by "0". The gnomon is very attractive, with a bird ensconced between the style and base. The dial was given to Howard University by the Lampados Club of Alpha Chapter, Omega Psi Phi Fraternity in 1929 to honor Benjamin Banneker, 18th century astronomer, surveyor and executing architect of the District of Columbia.